Do you have a young golfer that looks like a star in practice, plays great in practice rounds, but then gets to the golf course and shoots maybe 15 shots over what he does in the practice round? In “Sports Psychology Sessions with Doc,” Dr. Patrick Cohn answers a question from Cary about how he can help his young golfer take his practice game to tournament rounds. “I’m looking for help with my son… He’s a very good golfer but he doesn’t do well in tournaments. He hits the ball beautifully in practice and he play all the time. In casual rounds he plays great, but when he plays in the junior tournaments, he’s shooting in the high 80’s. What can you do to help him? 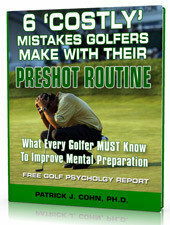 Why do some golfers perform much better in their practice rounds than they do in their tournament rounds? They shoot maybe around par or 75 in practice rounds and then shoot 85 or close to 90 in competition rounds. That means something is changing from practice to tournament rounds. What changes for golfers from practice to tournament rounds? Subscribe to the Peaksports YouTube channel Now! Download our FREE golf confidence report! 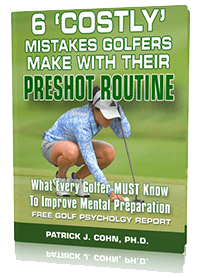 Here you’ll learn the top mental game strategies your preshot routine must include, 6 ways your mental routine breaks down, why indecision is your worst enemy in golf and more!